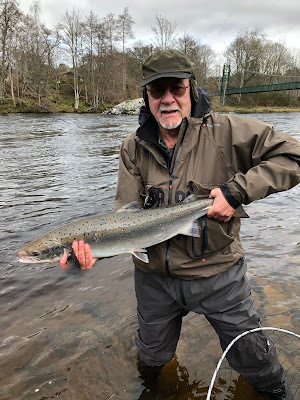 The river settled back overnight and fishing conditions were generally favourable this morning with light winds and occasional sunshine. There weren’t many fish showing in the high(ish) water but visiting angler Chris Ducker managed to find one – a very nice fish of 12lbs landed on the spinner from Port-na-Craig bank this morning. The river should drop back nicely over the coming few days – prospects look excellent.